The Thundercloud Galaxy is a where several civilizations are making a mad scramble to claim and colonize thousands of worlds. Colonists flock to the Thundercloud filled with dreams. Space pirates and an array of cutthroats also flock to the galaxy, guns in hand, ready to rob and fleece the colonists. Lawmen and heroes are in great demand, and the opportunities for clever adventurers are said to be without limit. The galaxy is a place of discovery, adventure and treachery like no other. Gene-Tech and their alien gear available to players. Colony Creation and Indigenous People Tables. 101 Ruin Adventures and Monster Creation Tables. 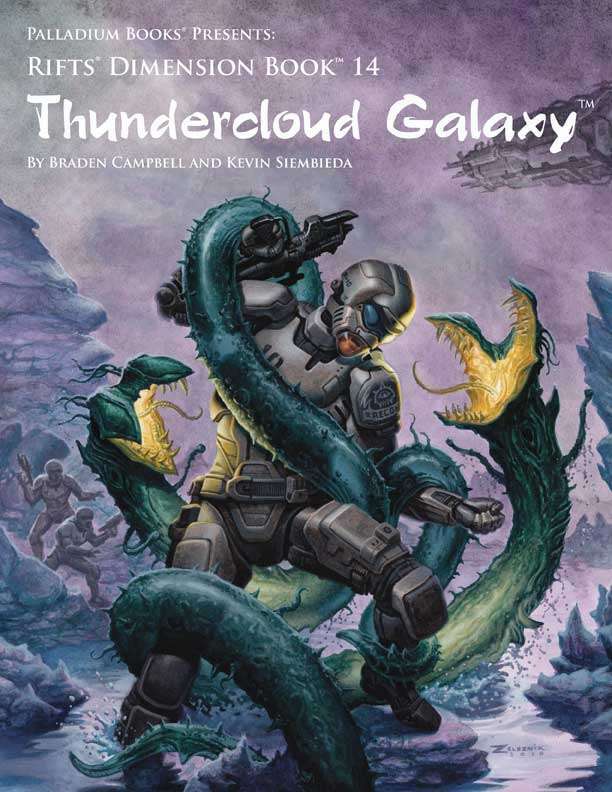 Overview of the Thundercloud Galaxy and adventure ideas. All the digital publishing are outstanding source materials for playing rifts and other games. But It lacks optimization from OCRing the book and advertisement on the back page is too heavy that often crashes on my pdf reader which is moonreader. I insist trying out yourself to see the problem I'm saying.